Aluminum bracket bolted to Harken hi-beam traveler supports swivel mount for double ratchet main sheet block and double cam cleat for dual ratio mainsheet system from Layline. 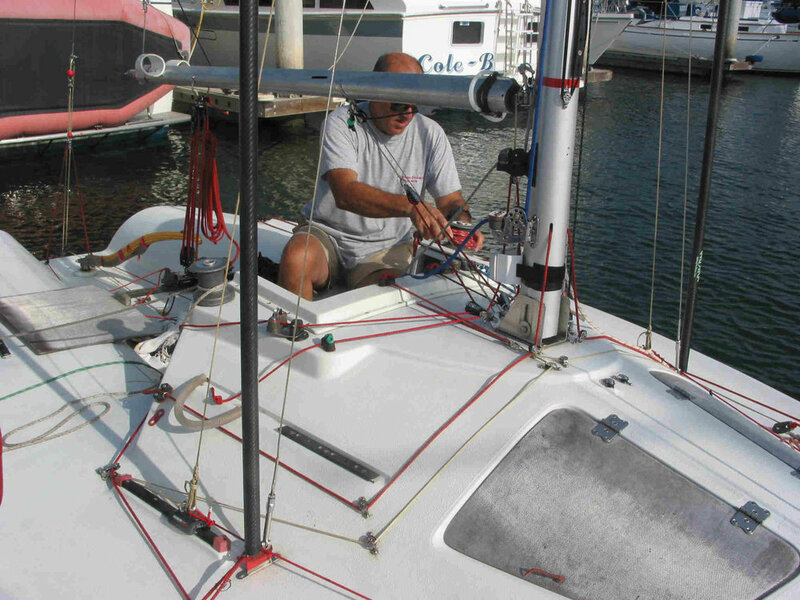 Double-ended backstay line and cleat on cockpit side beyond. Mainsheet Bracket 2 = view from top. Bracket sized to provide clearance between track and swivel for car and control line to pass. Traveler car is high-load Harken with cleats mounted on car. Some people use a windward sheeting car. Mainsheet Bracket 3 = view from bottom. Aluminum bracket (1/4" plate) bolted to traveler using SS bolts and nylon lock nuts. Ends of bolts are cut off to prevent damage. Aft lowers 1 - Adjustable aft lower track made from old original main traveler track. Aft lowers 2 - 2:1 control line. Black marks on deck next to track indicate light, medium, and heavy settings. Aft lowers 3 - Track mounted on angled teak block to align track with shroud.